Performers must have a certain ego - have that confidence to get onto the stage and strut their stuff. In a negative form, the ego creates fiction. We are fallible as human beings. Our greatness, if we are in any way great, is only as musicians. These are two different things. So that's why some of the old masters, outside of their music, were not necessarily good husbands, good parents, or even of great value to the community. This is not meant as a criticism; it's just that their commitment to their art was total. 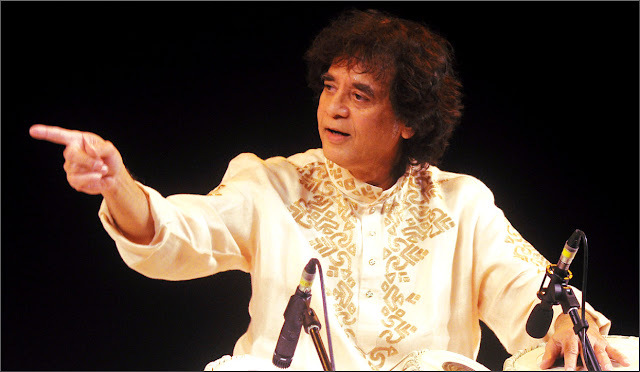 That is Zakir Hussain, who is seen above, speaking to Nasreen Munni Kabir in the volume of interviews with the tabla virtuoso recently published by Random House, India. Read, or forever live in darkness. Zakar Hussain: A Life in Music, was bought in Harmony Books at Assi Ghat, Varanasi, one of the great independent bookshops of the world. On An Overgrown Path is no longer linked on social media. New posts can be received by RSS/email by simply entering your email address in the right-hand sidebar. Any copyrighted material is included for critical analysis only, and will be removed at the request of copyright owner(s).